If you don’t own a single euro-style game in your board game collection, The Castles of Burgundy is a solid choice. If you LOVE euro games, then you probably already own it! And if not, what are you waiting for? Follow the link below to buy your own copy, and we’ll receive a small commission. A detailed strategy game for dedicated gamers set in medieval France. 15th Century princes devote time and effort to strategically trading and building their prosperity and their estates. Designed for players who relish strategy games composed with intricate details, colorful artwork and quality construction, The Castles of Burgundy challenges players with strategic options to acquire the victory points they need to win the game. Players work between the main game board and their own personal game board to acquire the possesions, points, wealth and knowledge they need to earn victory points. The quest begins from the moment the game starts until it ends, keeping everyone fully engaged and thinking of creative ways to buy, trade or sell as a means of amassing their fortune. Advanced game play rules are included. 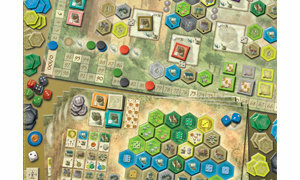 A game of both subtle and overt strategy, wit and patience, The Castles of Burgundy sparks the imagination with its various animals, land, building and ship tiles, as well as the give and take between the two game boards. Intricate play details promote cause and effect, attention to detail, mathematical calculations and patience. Since the game is played over five rounds, players must develop a strategy and keep the game’s objectives clear in their minds over a lengthy time period. Players compete against one another, but also against themselves, as they test strategies that could help them amass their assets more quickly than their opponents. 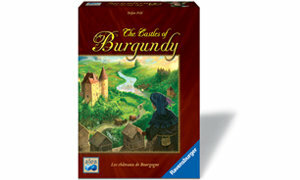 The Castles of Burgundy is for players who prefer games of strategy to those of luck. This is a game with historical perspective with the inspiring theme of France during medieval times. Players must be alert and ready to think clearly across two game boards, intricate details and multiple areas at once.